BUJUMBURA, March 28 (ABP) – A delegation of Mordovian businessmen on a business visit to Burundi, met on Tuesday March 28, 2018 at “Le Panoramique” Hotel in Bujumbura, with their Burundian counterparts grouped in the Federal Chamber of Commerce and Industries of Burundi (CFCIB) to jointly identify business opportunities in order to establish commercial and economic partnerships. According to Audace Ndayizeye, the CFCIB chairman, the delegation appreciated the climate that marked the exchanges. “This will lead to trade and investment partnerships in Burundi, and we invite Burundian economic operators to think about making contacts that can improve their business in particular and the development of the private sector and the country in general,” said M Ndayizeye. He seized the opportunity to tell his guests that the Burundian market is almost ready, and that all sectors are open to cooperation with the businessmen of Mordovia. He reassured them that CFCIB will do everything in its power to support all future business relationships. 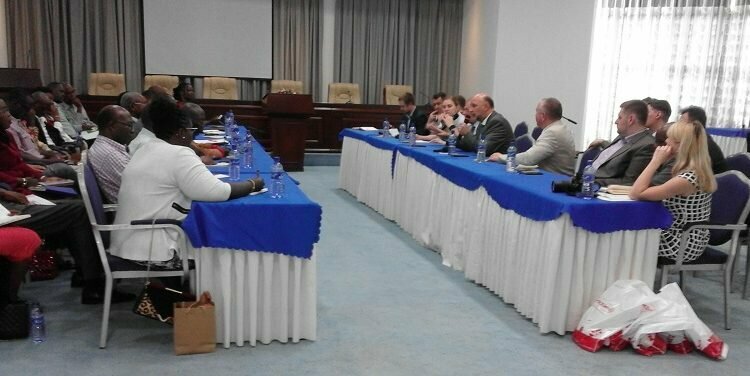 On their part, members of the Mordovian business delegation indicated that their presence in Burundi is part of the rapprochement between Burundi and Mordovia, despite the distance that separates it from Burundi. The delegation was, in part, composed of a group of folk dancers and a team of traditional musical instruments such as drums, flutes and fiddles. The members of the delegation made a presentation on the geographical location of Mordovia in relation to the Russian Federation of which it is a member and in relation to the world. They also discovered, through a presentation entitled “Investing in Mordovia”, their potential, particularly in the cultural, educational, tourism, industrial, commercial and economic sectors. They pointed out that the small Republic of 26,000 km2, with a population of 40 million, is full of businesses and has a high-performing educational system ranked among the best, even beyond Russian borders. According to the Russian Ambassador who accompanied the delegation, many results have been achieved in terms of economic partnerships. “We are pleased that some projects have started, and this is already a small step towards the industrialization of Burundi. He mentioned, among other things, Talinno (Tanganyika Lisma Lighting Innovation), a company specialized in the manufacture of low-energy light bulbs, which has to be officially launched today.